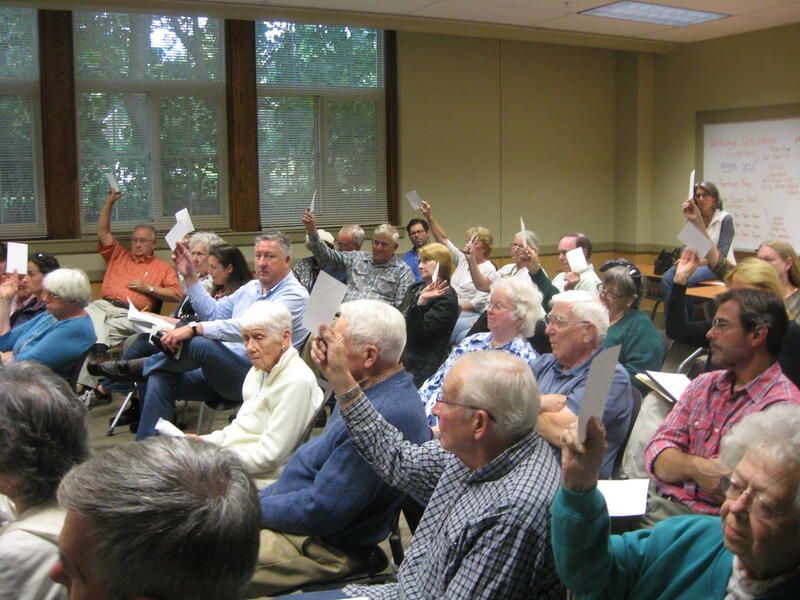 Members of Gorham Historical Society vote Monday to continue the society before electing a slate of new officers. preserving the society from collapse. Following passionate pleas Monday to preserve the Gorham Historical Society, members averted a potential collapse of the group. The historical society, plagued in recent months by lack of filled leadership positions and dwindling meeting attendance, rallied when a large turnout backed continuing the organization. Then membership elected a new slate of officers. They chose Suzanne Phillips, a School Committee member and former town councilor, as president. The society’s assets include archives housed in a town-owned building at 28 School St., and a White Rock farm bequeathed to the society several years ago. Disbanding the society would likely have led to legal issues. Gorham Town Councilor Ronald Shepard, a former historical society president, officiated at Monday’s meeting. “I would like the historical society to continue,” Shepard told the gathering that packed a large conference room in Gorham Municipal Center. “I think as an organization, we should elect a board. In a vote asking members whether they wanted the society to continue, the crowd unanimously agreed. Then, members chose new leaders. Other newly elected officers are Amanda Pearson, vice president; Bruce Roullard, treasurer; Amy Valentine, secretary; David McCullough, vice president of special projects; and Brenda Caldwell, executive secretary, who is also archivist. “Now, we have a working board,” said Shepard, who as a past president, became a member of the executive board. The historical society members last week were notified of Monday’s meeting in a letter from a small core group that held the struggling society together in recent months. Before voting, Shepard welcomed ideas and comments from the floor. McCullough, a former historical society president, delivered a lengthy talk about the society. He recalled some of its programs, newsletters and accomplishments over the years. “We had some grand times,” he said. McCullough recalled James Eddy, who left a 72-acre farm, the Jim Eddy Homestead, to the society. “He was a royal character. We are morally and legally obligated” to his wishes, McCullough said. Some families, Phillips said at the meeting, have been in Gorham since it was founded. Gorham began in 1736 when settlers carved civilization from a forested wilderness. “We want to preserve the history of Gorham,” she said. Phillips listed several ideas to bolster awareness of the society, like village walking tours for students. “We need to get out into the public,” she said. Marsha Weeks Traill, historical society lawyer and member, before the vote presented a financial overview of the organization and said the books are being kept correctly. Amy Valentine, president of Gorham Arts Alliance, located next door to the historical society’s archives building, said she had no idea at the beginning of the summer that the historical society might disband. Valentine was willing to oversee it. Before election of officers, Beth Parsons, the society’s longtime treasurer whose term had expired, stepped down. She thanked the group and spoke of the importance of the town’s history. “It’s been a pleasure,” she said about serving a long tenure as treasurer, and she received applause. “She’s done a great job,” Phillips said. As the historical society, founded in 1968, moves ahead, a member, Abbott Mosher, Monday suggested joint meetings with neighboring societies. Mike Sanphy, president of the Westbrook Historical Society, said Wednesday he’s willing to help and planned to contact Phillips. Phillips said five new members joined at Monday’s meeting. “It seems like we are already gaining momentum,” Phillips said. Annual Gorham Historical Society dues are $10. For more information, Gorham Historical Society can be reached at 839-4700 or by visiting www.gorhamhistorical.com. Elected Monday as Gorham Historical Society president, Suzanne Phillips chats following the meeting with a former society president, David McCullough. Saving Gorham Historical Society from the edge of folding, members Monday in a special meeting elected a new slate of officers. Pictured, from left, are Bruce Roullard, treasurer; Brenda Caldwell, executive secretary; Ron Shepard, a past president; David McCullough, vice president for special projects; Suzanne Phillips, president; Amy Valentine, secretary; and Amanda Pearson, vice president.